Red Raspberry is native to North America. 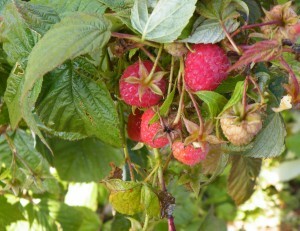 This photo is of the variety called Caroline, a late season everbearing raspberry. A unique feature is that the fruit hides underneath the leaves. To get this photo the leaves were pulled back to show the fruit underneath. These raspberries are cone shaped and not as juicy as the summer berries. The Caroline raspberries hold up better in cold storage as well. They also produce well into November. However the low sun angle and short days result in many berries not ripening though they attain full size. The fruit may be pale pink to white. This region is Zone 5a. 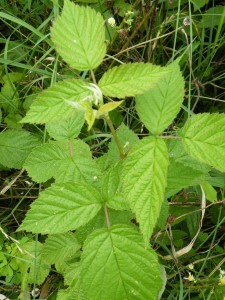 This photo shows a young red raspberry plant of the variety called Caroline. The berry plants produce sturdy woody stems called ‘canes’. When mature they send out new shoots called ‘suckers’ that can be close to the older canes or head out into the surrounding soil several feet away. If not cut out they will produce an over grown bed in just one season. There should be no more than 4 or 5 mature canes in one clump so that air can circulate and maintenance is easier as raspberries are easily attacked by soil born diseases. The new shoots which become suckers must be thinned out. Normally these grow into mature canes and produce fruit the second year. However with Caroline they will produce raspberries already the first season which is exciting, but also makes it hard to cut any of them away. Growers advise that the suckers be pruned out as they appear during the growing season leaving only a few with each clump, that align with the row, so that the bushes are easier to pick. But I let them grow until they are well-leafed out and about 24 inches high. Then I cut the canes close to the ground, bundle them, and hang them to air dry out of direct sun. The leaves will dry crisp before the canes lose their moisture. As soon as the leaves are dry they are cut from the canes. Then the leaves are crumbled by hand. This makes it easy to tell if they are really dry. If the leaves are not crisp and don’t crumble easily into bits then they should be air dried longer. Again keep them out of direct sun as the leaves will turn very dark even black from direct sun. Drying them in the shade, or on medium heat just until crisp in an electric dehydrator, will preserve the color. They will range in color from an olive green to a dark green, but should not be brown or black. In very humid weather, such as this summer of 2010, it is not wise to dry them outside as they may mildew before they dry. Instead cut the leaves from the stems, lay them out on cookie sheets and put them into an oven, with the door open partway (so moisture can escape). Preheat the oven to the lowest temperature and verify what that is with an oven thermometer. Ideally this should be no more than 160F, but many ovens won’t heat that low. Leaving the door open partway as if using the broiler, works to keep the leaves from over heating, but keep checking it every 10 to 15 minutes. For an oven that won’t go lower than 200F I preheat it, shut it off, put in the cookie sheet with the herbs, and let the residual heat do the work. Repeat this process, carefully checking for crispiness, until the leaves are thoroughly dry. If the oven heats unevenly turn the cookie sheet every so often. Check the leaves for crispiness every 10 to 15 minutes. When they are nearing done shut off the oven and let the residual heat finish the job, leaving the door open. As soon as the leaves are cool check them for crispiness. The stems might not be fully dry or brittle. When the leaves are fully crisp grab them by the stem and pull off the leaf portion. Collect all the crumbled leaves into a bowl, and discard the stems. The stems may be included in the tea if you wish to use them. Just make sure they are so dry they are brittle and snap when you break them. Caution. If using the stems they will be sharp when broken and this can be painful to work with. At this point wearing clean gloves would be helpful. Using both hands crush the leaves as small as you can. It’s best not to use a machine to do this. Doing this by hand it is easier to tell if the leaves are truly dry or if some of them may not be quite done. This isn’t always clear until the leaves have cooled and they are crumbled. One year I put the dried leaves into a canning jar and screwed on the lid and ring. Some time later I took out the leaves to make tea and discovered they were moldy. It is important to be very attentive to how dry the leaves are, and any herbal leaf or flower for that matter. If the leaves are not dry enough they will seem leathery and instead of crumbling will more likely just wrinkle. They should be returned to the oven for another few minutes. I’ve been fooled more than once thinking they were dry enough, only to find a few that were leathery. These can spoil the whole batch. If the house is dry and there are west side windows, the afternoon sun will do a lovely job of drying a cookie sheet full of leafy herbs even large ones like comfrey, in a matter of hours. Once the leaves are dried crisp and crumbled then pour them into a glass canning jar. Plastic zip lock bags may be used but the jars really do keep them fresher. If bags are used then keep the bags of herbs inside another container with a tight lid. Label the container with the name of the leaves and the date collected. A great way to use raspberry leaf tea is to make up a quart of it early in the day and then after it is strained keep it in a glass jar in the refrigerator. Do not keep it longer than 24 hours, rather make a new batch. The used tea leaves can be dug into flower pots, or used in the compost pile. The best time of the year to cut the suckers for tea is early August up until first frost. As the weather cools the leaves will become thicker and darker. The tea made with them will be stronger. A light frost will tinge the leaves with red or orange around the edges. If this is the only time to get the leaves then I’d use them. But ideally the leaves should be mature, undamaged by insects, organically grown or if wildcrafted, from areas where there are no fields close by that have been sprayed with chemicals. Also check that they have not been touched by frost, or diseases which will discolor or deform the leaves. A note about the variety Caroline. For 5 years I’ve grown this variety and really love it. The bushes are low growing, about 3 feet, and more compact than the traditional raspberries like Latham or Heritage. Because of this growing habit and prolific fruit production Caroline would seem to be a good berry to grow in buckets under grow lights over winter, or in a south sunny window. They seem to just keep on producing berries with only deep cold stopping production. Red Raspberry Leaf Tea, health benefits. This article is provided as information only and is not intended to replace medical advice. Many people however have used red raspberry leaf tea without any side effects. It has a pleasant slightly astringent taste. One mother I know mixed it with apple juice in order to get her children to drink it since they were not used to drinking tea. Dr. Christopher (ND., School of Natural Healing) always extolled the virtues of red raspberry leaf tea. Red raspberry leaves are a great aid in times of cold or flu and provide the body with iron in an absorbable form. It is high in calcium, making it an important tea for the pregnant or nursing woman. Throughout the history of American Botanic Medicine, red raspberry leaves are mentioned as a tonic for the female reproductive system. Its astringent properties help strengthen the uterus. Dr. Coffin, of the early American Botanic Medicine School mentions red raspberry leaves extensively for every phase of pregnancy. Jethro Kloss states in Back to Eden that red raspberry leaves will allay menstrual cramps and promote a painless labor. Dr. Christopher has always advised nursing mothers to drink marshmallow root tea to increase milk flow and red raspberry tea to enrich the milk. In the booklet The Cold Sheet Treatment and Aids for the Common Cold, Dr. Christopher explains how to conquer the cold by fasting on red raspberry leaf tea. The leaves contain fragrine, a substance that affects the muscles of the pelvic region. The astringent and nutritive properties of red raspberry are employed in Dr. Christopher’s lower bowel formula, the female corrective formula, and the herbal eyebright combination. The great medical botanist, Dr. Samuel Thomson, used red raspberry in his patented system of medicine. Lobelia was first given as an emetic, then cayenne was administered to restore heat to the body and red raspberry was taken as a tea to remove canker from the digestive tract. Red raspberry leaf tea may be used as a gargle for sore mouths and throat canker, according to the English Herbalist, Maude Grieve. Externally the tea can be used as a wash on ulcers and other wounds. The herb also aids in setting the stomach. Red raspberry can be easily cultivated. It should be planted in the spring from suckers taken from plants that are a year old. The suckers can be set three feet apart with six to eight feet between rows. The soil needs to be moist and the plants should be exposed to full sun. 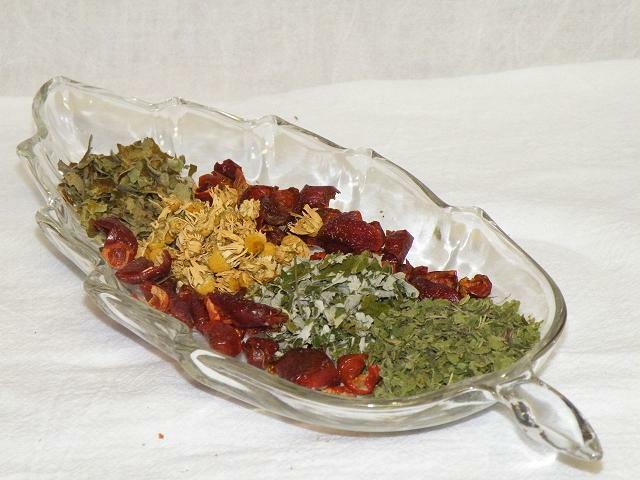 Red raspberry leaf tea should be kept on hand for women and women-to-be. A mother should give a young girl a cup of red raspberry tea every day as she approaches puberty. This will make the transitional period much smoother. pour the boiling water over the herbs and then steep fifteen or twenty minutes in a warm place, strain and drink. It is best to drink three or more cups a day of this tea during the entire pregnancy. It is a pleasant-tasting tea and is also an anti-nausea. • To find an herb shop that carries red raspberry leaves and other Dr. Christopher herbs check out http://www.christopherwebsites.com. TONIC: a medicine that invigorates or strengthens; pertaining to, maintaining, increasing, or restoring the tone or health of the body or an organ, as a medicine. ASTRINGENT: a substance that contracts the tissues or canals of the body, thereby diminishing discharges, as of mucus or blood. Summer Essence Tea. In the center of the leaf shaped dish are yellow chamomile and to the right are raspberry leaves. The underside of the raspberry leaves is a silvery green in contrast to the darker top side.